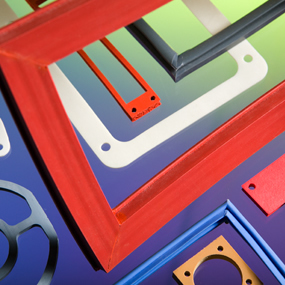 Adpol manufactures silicone rubber gaskets to customers exact specifications in a wide range of profiles, rubber types, colours and hardness’s. Based upon your drawing, existing sample or by working with you to come up with the most suitable size, shape and material type we will produce exactly the seal that you require. This can be supplied in extruded lengths from 10m upwards, or joined into circular gaskets, or cut and joined into square gaskets. All of these can be supplied adhesive backed if required. We also manufacture silicone rubber sheet, so if you need flat puched or water jet cut gaskets we can help here too. From drawing to production of a profile typically takes 2- 3 weeks and will cost around £200 for a die and first off sample. We have 40 years experience with silicone rubber gaskets and understand what works well in certain situations. We manufacture in a wide range of specialist material grades, that have been developed to cope with the most challenging requirements and environments, take a look to find out more. To find out more or get a quote please contact us by phone or e mail, or drop in and see us we are always happy to help, and put customer service right at the front of what we stand for.